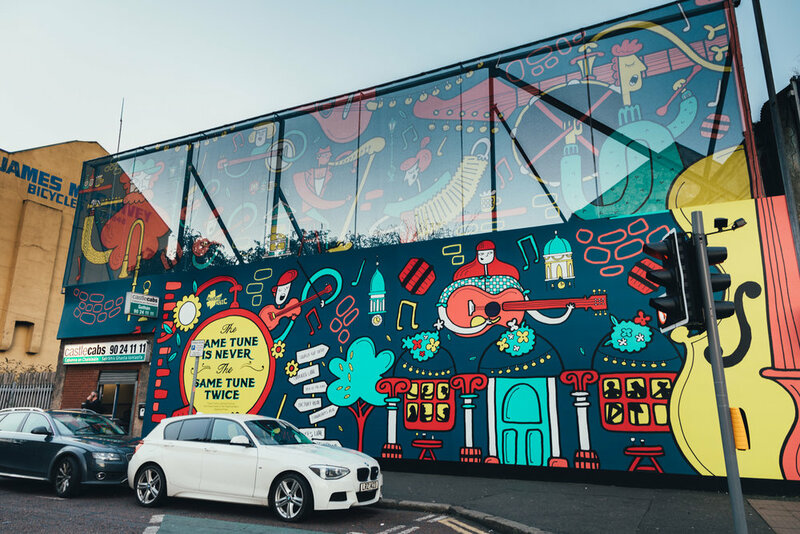 As part of the Belfast Music Story project, Tandem were commissioned by Belfast City Council to design music hoarding which responds to two elements of Belfast’s music history; Traditional Music & Punk Music. Traditional music has a long history within the city, dating back to events such as the Harper’s Music Festival of 1792. Over time, this genre of music has become a strong symbol of identity for locals and visitors alike. To help develop our initial concepts into tangible designs, we commissioned an illustrator to work closely with us to create a vibrant and lively image. The final illustrated hoarding hints at the the historic cityscape of Belfast — recognisable features of city hall, bricks and cobbles, gas lamps and the lively pub scene that we peer into from the street, all come together to form a picture of Belfast. Oversized instruments sit comfortably alongside illustrated musicians, alluding to the traditional genre of music. Perhaps most importantly, this contemporary street art, reflects the vibrancy of Belfast today, while alluding to its heritage of traditional music. Turning our attention to the Punk theme, our interpretive team made contact with the Oh Yeah Music Centre in Belfast and made contact with a variety of locals directly linked to the punk era, to source potential imagery and content. Using this wealth of image research, we adopted a graphic approach not unlike that of the punk era. Graphics include concert tickets, button badges and zine covers, all taken from originals of the Punk movement in Belfast. We utilised quotes and lyrics, to reiterate the original message of punk. To engage the passer-by, and create a point for conversation, we developed a photo opportunity within the hoarding — the outline of a stage and band is illustrated using brightly coloured hairstyles and instruments, encouraging people to interact with the display. The installation of the graphics will taken on original techniques such as flyposting and spray painting, to enhance the authenticity of the hoarding, helping it to blend into the fabric of the city. The punk hoarding is due to be displayed later this year.